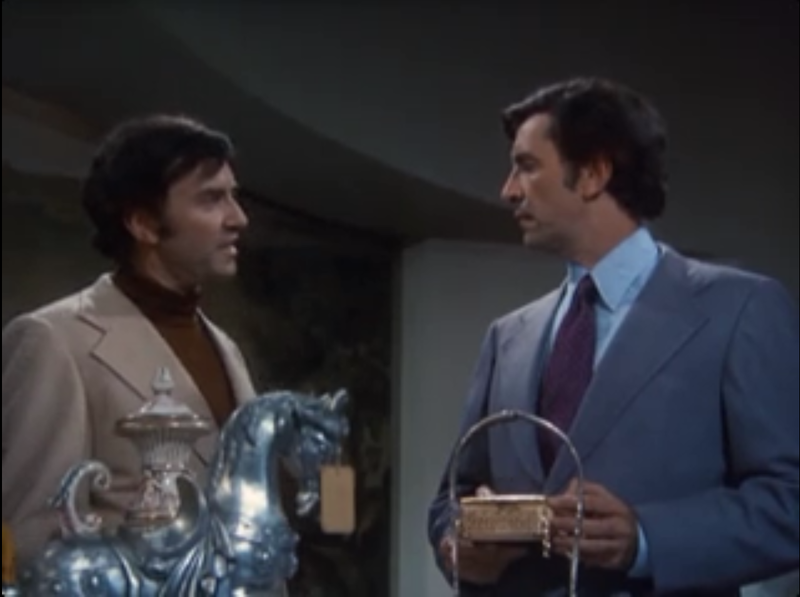 Kerensa: I knew that going into Columbo it would be hard to top the wonderful Remington Steele from last week. While I didn’t totally care for Hart to Hart, the utter absence of women in substantial roles in comparison to what we had previously watched felt completely regressive. The mystery of “Double Shock” centers around the death of Clifford Paris, an extremely wealthy man, who is found dead, slumped over his exercise bike on his wedding night to a much younger woman, Lisa Chambers (Julie Newmar), who discovers him initially. His constantly feuding twin nephews Dexter and Norman (both played by Martin Landau) are set to inherit the estate which is worth millions. The only two women in the entirety of the show, Lisa and Mrs. Peck (Jeanette Nolan) are terribly characterized. Lisa, who was Clifford’s fiancé, is obviously questioned about her affections for Clifford because she’s much younger. When Columbo comes to question her, she’s doing Pilates (was this a thing in 1973?) and he’s just blatantly ogling her even going as far to say “I enjoy watching.” Ew. And when Lisa seems to get interesting and asserts some backbone with Columbo, she’s dead in a matter of scenes. Mrs. Peck, the housekeeper/manager, is just unbelievably shrill and concerned with the cleanliness levels of the house. You know, because women be cleanin.’ She yells at Columbo for a multitude of things over the episode, all very understandable situations, but she is characterized as such where you don’t even care if she has a point. And that’s it. That’s what we get and in comparison to having dynamic females like Laura Holt and Jennifer Hart (yes, I was a tad harsh on her), this is insanely depressing. Beyond the depiction of women on Columbo, I didn’t even find the general plot compelling from the moment it began. It was so obvious that either one or both of the twins, Dexter and Norman, were in on the murder of their uncle, as neither one made very convincing cases for their innocence in their completely shifty statements to Columbo. And Columbo, himself, was in my opinion bumbling and seemingly inefficient. Yes, he solved everything, but I didn’t feel that he was dynamic or interesting in any respect. 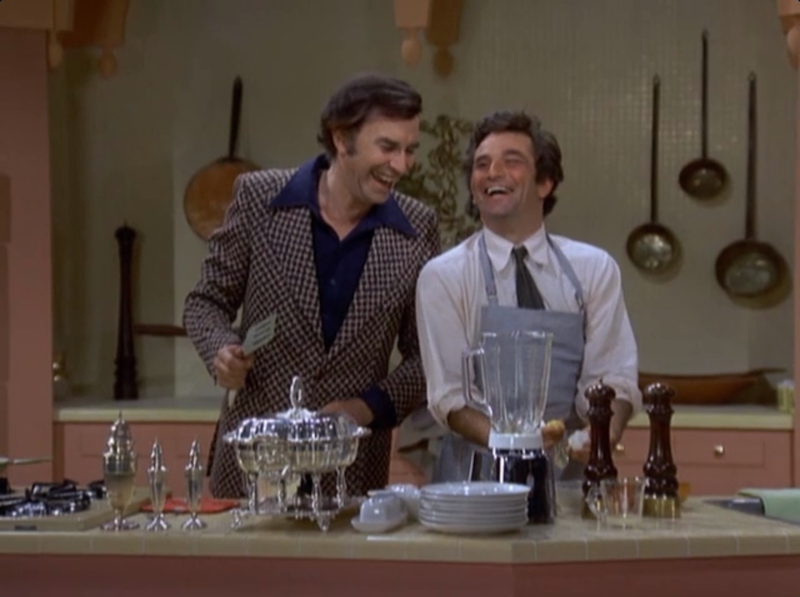 My favorite part of the episode was the bizarre scene, where Columbo joins TV food personality, Dexter, to make hollandaise on national television. It was just so strange with their interactions and just didn’t seem like it fit completely in the context of the plot, but it was funny. There was a chick in the background who had some massive, literally huge, hair who may have been my favorite part of this episode. Basically, I felt like the tagline of this episode could be “white rich dudes with material afflictions commit crimes to gain more skrilla.” Sorry if I offend you, Columbo fans. Cameron: Well, that was… bizarre. I didn’t really know what I would be getting into when I first started streaming Columbo, and I think I’m still puzzling out just what the heck I watched. Frankly, this is the least interesting mystery plot of the ones we’ve seen so far. But there’s a part of me that thinks that was probably the point. Peter Falk is the real star here as Lieutenant Columbo, who staggers out of bed late at night to solve a murder most foul. And his approach to problem-solving is that he doesn’t really seem to have one; indeed, Mrs. Peck calls him a “hobo” and a “bum” at different points in the episode, speaking to his appearance and lack of manners as apparent identifiers for his class… or something. The other thing that stood out most, and the thing I’ll take away from watching this episode, is how utterly naturalistic it felt. Kerensa already talked about the cooking show scene, which was adorkably awkward, but even outside that scene, the characters often felt so prepossessed by their own motivations that conversations never felt like they were happening on purpose. Even right up to the moment when Columbo is demonstrating how the victim died in the last scene, and how he can conclusively prove it was both brothers, he seems unsure of exactly how to go about it. Together, these two things put Columbo a far cry away from Remington Steele or Hart to Hart, both of which have an injection of “class” in the mix. For the Harts, and Remington and Laura, it’s about getting the tuxedos and dressed mussed up in the line of duty. But Columbo wears his line of work on his sleeve, and though he’s frequently humble about it to Mrs. Peck, he’s also incapable of changing. “It’s just a fault of mine,” he tells her, and it’s why, I suspect, people would have wanted to tune in to watch the show. And maybe it’s just me, but I found the ragged simplicity of “Double Shock” to be quite charming. While I really enjoy the overflow of cheese and puns that comes with the likes of Hart to Hart and Remington Steele (though the latter certainly has more, better stuff going on), I can only take so much. Thus, it was nice to go back further in time to see the kinds of programming that Hart to Hart and Steele were likely responding to in the early 1980s. I don’t think we can say anything new about Peter Falk’s work as the title character but he is damn good at embodying an intelligent screwball who is always the smartest guy in the room, even if he doesn’t really know it yet. It’s interesting to think about Columbo as one of the medium’s fundamental figures, one that help further the “moderately dysfunctional, borderline solipsistic detective” character type and how those characters live in very specific shows that differ greatly from shows about partners or even teams. 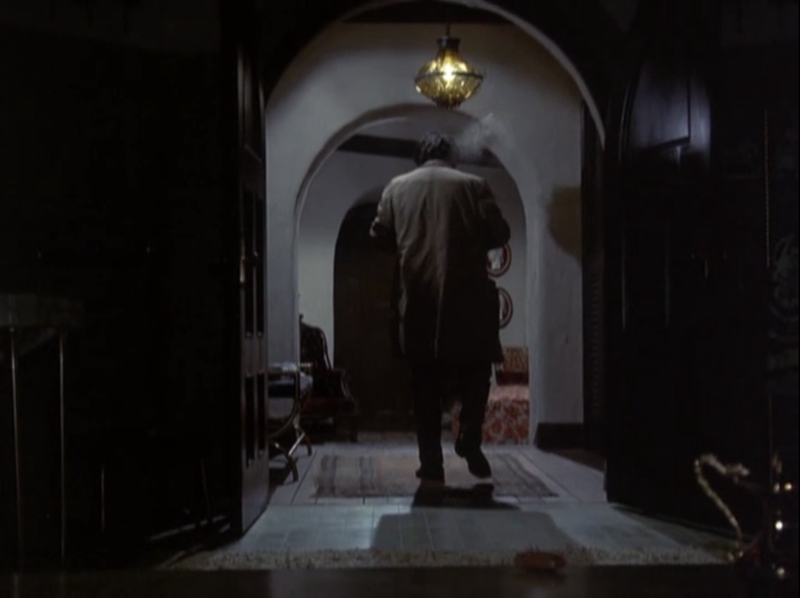 Monk certainly borrowed from Columbo quite a bit in a more contemporary context, which really just shows off the power of the character type and what it can do for great actors working with it. Plus, Martin Landau did strong work as the twins here. They were differentiated well enough, and though the conclusion was clear from the very beginning, I really enjoyed how the brothers played off of Columbo and both assisted and impeded with the case at various points. The episode kept finding decent enough reasons to put the title character in close proximity with his suspect without straining credibility too much. I’d also note that this episode/show seems at least slightly more interest in procedural process. The first two shows definitely highlighted the duos’ investigative work but also had premises, both on the fundamental and basic levels, that could take the leads in different directions. 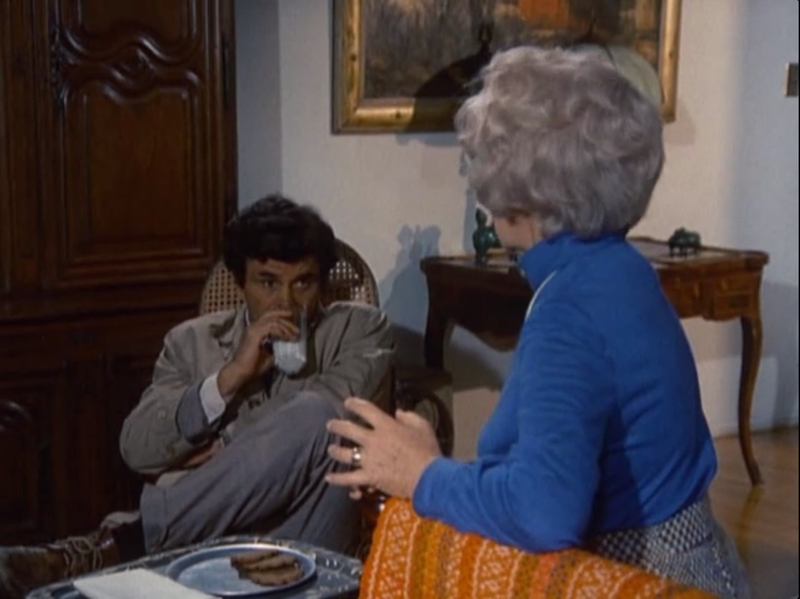 Here, the case leads Columbo to do some random things—the cooking show set visit most notably—but the attention is on his work. Jessica: Columbo could do some wonderful characterizations, but they were primarily limited to the antagonist of the week, which meant if the murder was a murderess you could get a great role to sink your teeth into. However, the rest of the cast would usually be nothing more than stock types. That’s especially unfortunate here as Newmar is an underrated performer—she had a mesmerizing guest spot as a proto-hippie on Route 66. So there’s not really much to talk about with regards to women as there aren’t much women. That said, it’s a good example of why Columbo was such a solidly satisfying show. Landau is wonderful, and he’s obviously having a great time playing two characters. You never doubt Columbo will crack the case, the pleasure comes in watching him get there. Les: I’m definitely on Cory’s side for this debate. I’d say that of the three shows we’ve watched so far this is the least compelling, or at least the one with the least sense of fun about it, but that doesn’t change the fact that I enjoyed watching this story unfold. There was a respectable sense of pacing as Columbo gathered details about the investigation, enough of a split between the investigation and the suspects to keep things balanced, and despite the lack of gunfights or chase scenes it didn’t feel spectacularly dull*. And I even found the resolution of the mystery to contain an interesting twist—we knew from the start that one of the brothers was the killer, and the story kept us guessing so much throughout over which one was guilty, it didn’t even cross my mind until the last scenes as Columbo played out the need for an accomplice that the twins were using their twinness to their benefit. *Frankly though, I could have done without the whole cooking show segment. (Sorry Kerensa, don’t mean to disagree with every single one of your arguments.) I can definitely see the value in it for putting Dexter more at ease with Columbo, as well as giving Columbo more of a chance to seem unassuming, but that whole scene was superfluous to the investigation and just dragged on entirely too long. In terms of some of the show’s more problematic gender relationships, I think the “different time” angle is worth considering, but more important is the fact that Columbo isn’t trying to be the same kind of show as Remington Steele or Hart to Hart. This isn’t a police procedural built around a central relationship or one that incorporates an ensemble cast, this is the story of the guy whose name is in the title card. And truth be told, I find it hard to get mad at a show for not doing one particular thing when it’s clearly trying for something else. And as with many other shows of that ilk, this is another one that’s entirely worth watching for the solid performance at the center. As played by Falk, Columbo is the quintessential hard-working detective, the one who trods along trying to do his job, uncaring about his personal appearance or the impressions of those around him if it means getting things done. 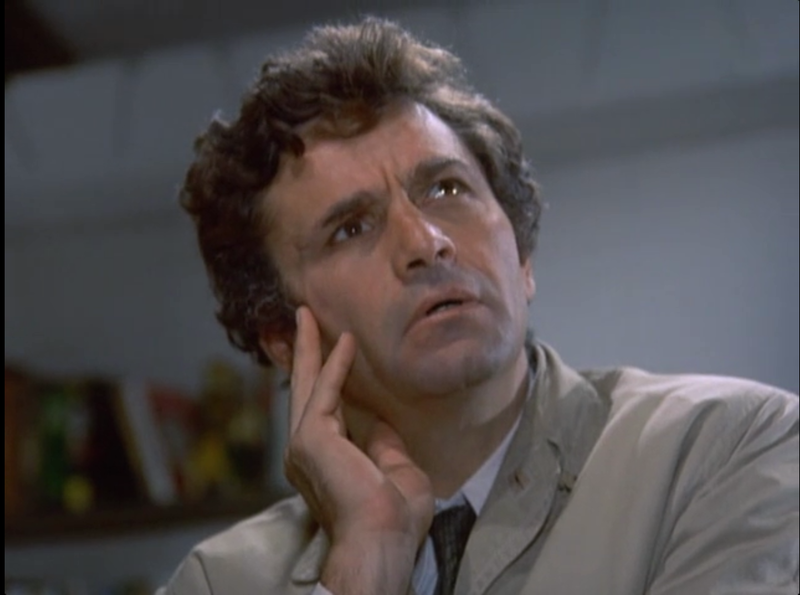 Watching Columbo work is a bit cringe-worthy but it’s still fascinating, that half-distracted, half-observant style of investigation that frustrates everyone around him but disguises the fact he’s seeing things no other cop* does. In Columbo you can see the template for a legion of detectives, from Carl Kolchak to Bobby Goren to Adrian Monk to the Jonny Lee Miller/Benedict Cumberbatch incarnations of Sherlock Holmes. He’s respectful of those he talks to, ever apologetic for when his behavior seems to go a bridge too far, and while he never leaves quite when he’s asked to he does still leave. There’s a quiet dignity about the character that neither Pierce Brosnan or Robert Wagner could touch in the flashier detective shows we’ve watched the last two weeks, and there’s value to that. *And it was a welcome change of pace to see there’s not a long list of other officers questioning his methods or trying to pull him off the case. If anything, the other officers are either non-entities or treat him with a fair amount of deference. What set the tone for me very early on was the moment where, sleep-deprived and likely hungover, he makes his way up to the master bathroom to clean himself up. Then in the mirror he sees the missing towel on the rack, which leads him to the damp towel in the hamper, which leads him to the signs the tub has been used recently. He thinks for a moment, and then he quietly cinches up his tie, puffs on his cigar and heads down the stairs to treat this as a homicide investigation. Columbo might appear distractable, disheveled and even a bit dense at times, but he’s a professional, and once it’s established as a real case there’s no question he’s going to solve it. COLUMBO was never a mystery in the classic sense. It wasn’t a “whodunit,” but in fact a “howzegonnacatchim.” It’s also easily one of TV’s top cop shows, if only for Falk (always brilliant), the clever plotting, and (in the best episodes) top-flight casting of the week’s guest murderers. Landau, one of television’s most underrated actors (his Rollin Hand is really fascinating), is really good as the twins, and director Robert Butler’s revelation of the twin brother is handled very well. “Double Shock” probably isn’t among the show’s best episodes, but it’s certainly a solid B. As for the cooking sequence, it was probably added as padding. It was often difficult to construct a 90-minute mystery (and the 2-hour episodes almost always pale next to the 90-minute shows), and scenes were often added that didn’t propel the plot. Which is fine with me, so long as the scenes are interesting on their own. Today’s television could stand to kick back occasionally and just let its characters “be.” Falk (love the way he portrays total delight) and Landau play the hell out of the scene, which doesn’t help solve the mystery, but it does add color and character to the episode. Why is Newmar doing Pilates? Probably it was Newmar’s idea, since she was (is?) very much into exercising. As for the episode’s portrayal of women? Well, I don’t know, I think you’re missing the point. I suspect the reviewers have not seen very many “Columbo” episodes. Each one was sort of a self-contained feature film, subject to the variances of the scriptwriter’s and the director’s vision that particular month (the series aired about one episode a month). While there was a definable consistency to the structure of almost every episode, the direction, the score and the guest villain made each episode quite unique. Double Shock isn’t one of the better “Columbo” installments. In fact, I’d say it’s in the bottom third of all the episodes in the NBC incarnation of the series. 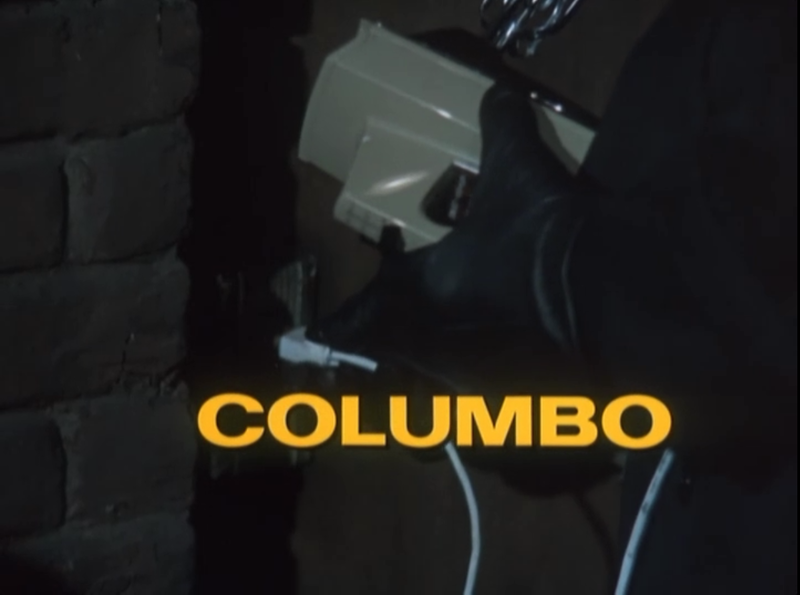 Please, review an episode like By Dawn’s Early Light, with Patrick McGoohan, or Any Old Port In A Storm, with Donald Pleasance, for a much richer and fully realized “Columbo” episode than one can get from a second-rate offering like Double Shock. I am curious to know how these particular episodes were chosen.